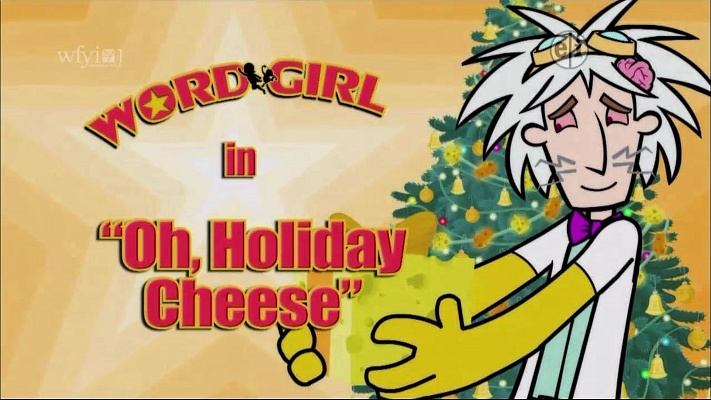 The holiday episode is a fine example. After the narrator introduces the episode's special words (curmudgeon and festivity, in case you were interested), the episode shifts to a brief battle between WordGirl and Energy Monster. WordGirl and Captain Huggy-Face (her partner, a space pilot/monkey who comes from the same distant planet as... sorry - I'm getting off track) take care of the monster problem, then transform into their civilian identities of Becky Botsford and Bob. They head home to the Botsfords' home for a cheese-themed holiday party. Meanwhile, across town the villainous Dr. Two-Brains (a scientist who was once friends with WordGirl before an experiment gone wrong fused a mouse brain to his head and turned him evil - I LOVE THIS FREAKING SHOW) has upgraded his teleportation ray to work long-range. He sees the Botsfords' celebration and decides to steal their cheese. Becky and Bob slip away and transform back into their heroic identities then burst into Two-Brains' lair, only to be snared by his henchmen's string-cheese guns. This doesn't hold them long - they trick the mad scientist into hitting the cheese with his ray in reverse. As usual, the episode works because the writers maintain a sense of humor about the material while still delivering a story within the genres presented. This is, at its core, a superhero story, regardless of how silly the villain's plan or motivation is. The holiday elements are front-and-center, as well, playing with the usual conventions, albeit with the series's usual wit. Sure, it's cheesy, but they acknowledge as much in the episode's title. This is officially a "holiday" episode - the word "Christmas" is never uttered, despite the prevalence of secular Christmas decorations and tropes. It's subtle about the choice, but consistent. All in all, it's a solid installment in a great series. There are definitely better episodes, but this is certainly enjoyable, especially if you're looking for something safe for all ages.